The Muziekgebouw Frits Philips Eindhoven is one of Holland's most contemporary music venues. 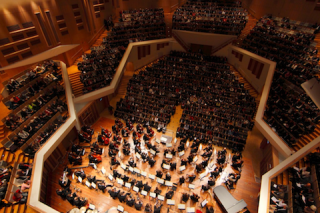 Located in the heart of Eindhoven, its mission statement is ‘to inspire and challenge’ and the center regularly plays host to a series of world famous philharmonics and soloists, as well as contemporary artists such as Emmylou Harris. Welcoming more than 160,000 music lovers every year, the venue recently upgraded its audio system, following a full interior and exterior redesign in 2010. L-Acoustics KARA system reaches every audience member. Photo credit: Bram SaeysThe Muziekgebouw Eindhoven was designed with absorptive and reflective panels all throughout the room—great for acoustic performances but a challenge for amplified music. Dutch audio provider Sales All was brought in to design a system that could guarantee a high fidelity sound experience to each and every audience member. Sales All’s system designer Ben Brouwers chose an L-Acoustics KARA system. A 22-box, two-way, L/R KARA system was installed, complemented by eight two-way XT coaxial loudspeakers. Low end reinforcement came courtesy of SB18 subwoofers, which were configured cardioid, to avoid slap-back echoes from the sub-low frequencies from the rear side of the stage. The system is driven via LA8 amplifiers, while a Dolby Lake LM44 processor was chosen for control. Local concert promoters were consulted during the commissioning phase, as one of the main goals was to provide a rider-friendly system that would be easily accepted by a wide variety of acts. After the design phase, extended testing was carried out with live bands and theatre shows. The KARA was ideal as it could be rigged and de-rigged very quickly with its lightweight chassis, combined with its easy maneuverability. “The total array is divided into two parts, and is transportable in custom made dollies,” says van der Linden. “This results in a very versatile system, which is easy to assemble and disassemble, and that's a huge advantage for the venue, as the shows are so intense, and also very varied.